Have Fun Cooking Healthy, and Win S$5,000 in HPB's Photo Contest! Let's face it - we all know that the healthiest way to eat is to take charge of our own food preparation. But it takes planning and is not necessarily cheaper than eating out. Still, the reward of feeding the family right should far outweigh the cost and effort. Why not turn cooking into a joint activity for family bonding as well? Not too many generations ago, food preparation often involved the extended family. Grandmothers, aunts, sisters, sons, cousins would share the tasks of chopping, slicing, pounding ingredients and make slick work of even the most complicated dishes. There was often a lot of unspoken love and bonding created even before the food made it to the communal table where it was enjoyed by the whole family. Today's family nucleus is much smaller, and both parents often have to work. But we also have a lot more information today about healthy eating, and easy access to many recipes on the Internet for healthy dishes. And we have such amazing choices today in terms of ingredients available to us. You can get really creative. 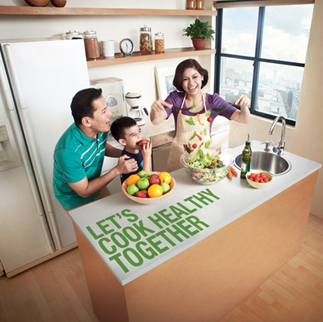 The Health Promotion Board (HPB) of Singapore is organising a photo contest to encourage families to take this step of cooking healthy together. Check out the official "Let's Cook Healthy Together" Photo Contest page to see video recipes of chicken rice, chicken curry and Creole crab cakes with mango salsa. Gather up to four family members (including one child below the age of 18) and snap away while you cook. Upload the photo on to the contest on the HPB Facebook page. That's pretty much it - simple! The prizes are pretty generous! Plus, there will be 11 consolation prizes of $100 worth of vouchers each! Sounds so good, I think I'll gather up Nadine and Jolie for some cooking or baking! They're always nicking my utensils to play anyway, and they'd definitely love a chance to do some real "masak masak" (cooking). If you'd like more inspiration for healthy recipes, check out HPB's Healthy Chef app for iOS devices. There are over 70 recipes from various cuisines - Chinese, Indian, Malay, Western - and you can view calories, adjust the servings required, compile a shopping list and even rate the recipes. Best of all, the app is free! All images courtesy of HPB.